I last met Michel Tardieu in 2000, when I visited his original cellars, squeezed into the ancient walls of the castle of Lourmarin in Provence. Since then, Michel and his former partner, Dominique Laurent of Burgundy, have gone their separate ways, and Michel has moved the operation to a much more practical cellar in the town. 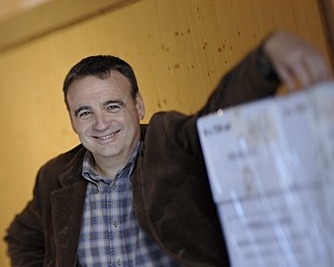 He continues to make some of the Rhônes most elegant and profound wines, buying fruit from growers he has worked with for a decade.Michel is an éleveur, whose job is to select, mature and bottle wines. Each February, the barrels of wine that Michel has selected from his growers reach Lourmarin, to be aged in a regime that is totally perfectionist. All Syrah is aged in new oak, all Grenache in one-year-old casks. The duration of the élevage will vary from 18 to 24 months, depending on the appellation. Wines are bottled by hand, without filtration. Despite the use of plenty of new oak, I find these wines to have great finesse and energy about them. The fruit is all from very old vines of at least 40 years or so, with much of it 80 years old more more. There is natural concentration without over-extraction, which results in powerful yet balanced wines with real poise. These wines are available from Raeburn Fine Wines in Edinburgh, and see wine-searcher for other stockists. A very crisp, elegant lemon and crunchy pear fruit on the nose, in this blend of 70% Marsanne and Grenache Blanc. Fermented in 50% new oak, the rest is older oak. The Marsanne comes from northern Rhône. Michel makes the assemblage from separate parcels. The palate has a similar tightness and crispness as the St Peray, with terrific zest and brightness allied to an almost tropical fruit that starts to emerge with Acacia honey delicacy. 6000 bottles. Cracking little wine this, with a bit of bottle age on it. £12.99. Michel describes this as ‘A more traditional wine,’ than the Cornas Coteaux, made 100% with stems (unlike the Coteaux 2005 in this tasting) from a really old Syrah clone and 80-year-old vines. Really meaty, gamy, animal nose with some minerality and good plummy fruit. Delicious palate, with a lovely life and savoury balance, and a great deal of grippy, leather and cedary background. Gorgeous balance and finesse here, though unfortunately Michel’s source for this fruit has disappeared, as the farmer he bought from has sold up and retired. Out of stock at raeburn, but see wine-searcher. Around £50.